Swamis are most notable for their speech. They share their wisdom through their speech. They sit on a raised platform, among hundreds of followers, and impart transcendental knowledge through spiritual sound vibration. This sound slices through the ignorance and fogginess of our consciousness, illuminating our hearts with all those qualities that evade us: mercy, compassion, tolerance, austerity, kindness… the list is very long. The very process of bhakti begins with this transcendental hearing process. Pin-drop silence is expected when a great personality is speaking. Proper etiquette mandates this. 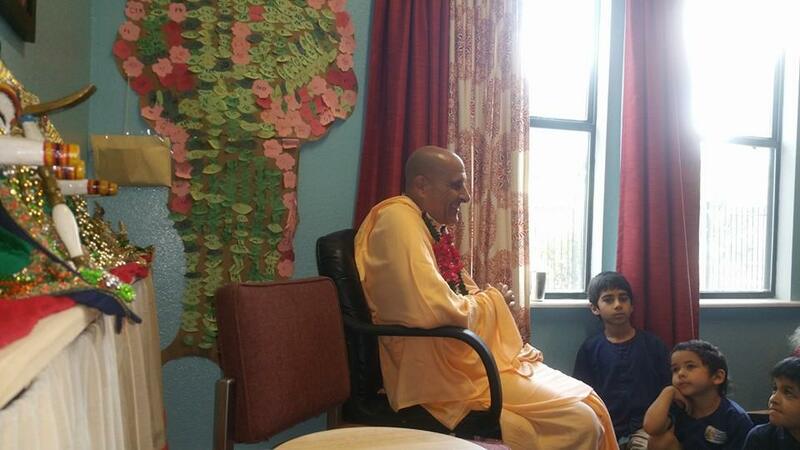 His Holiness Radhanath Swami, author of international bestsellers, “The Journey Home” and “The Journey Within”, however, visited TKG Academy and did just the opposite. He listened. Yes, I’ll say that again. He didn’t speak first. He listened! As the teachers shushed the kids, feeling embarrassed that they dare to speak out in front of such a stalwart, world-renowned sage, he smiled and said, “No. Let them speak!” As he asked open ended questions, the room erupted in answers from all the kids, ages 4 to 14! “Shhhh,” the teachers nudged.. “No no.” In response, the Swami shushed the teachers. For more than an hour, he relished listening to the young student’s words. He smiled and laughed. He truly loved hearing their many thoughts. And they could feel it. If only these children knew who they were sitting in front of. Hundreds of thousands of pilgrims join him on pilgrimages all over India, straining to hear even just a few of his transcendental words. Every time he arrives in a temple, it quickly gets filled up with true seekers, wishing to hear from him. I’ve had the real fortune of knowing him since I was 14 myself. Every time we visited him, he made us feel as if we were the most important, most valuable people he has ever met. He made us feel like this was the most important encounter in his life. Never mind that he meets with and teaches tens of thousands of visitors regularly. Each person gets the same feeling. Growing up, every one of my gurukuli friends felt the same way. We had decided that it must be like this when meeting the Lord in our hearts, Sri Krishna. Today, our lucky students also got this opportunity! A true well-wisher. A true listener. After connecting with their hearts, he shared the magical pastimes of Sri Nrsimhadeva. He spent time with them, almost as if he was one of them. The adult ego, “I’m an adult, you need to listen to me,” was non-existent. Is there any adult who truly can connect with kids like this? I’ve never met one. It was one of the best days of the year. 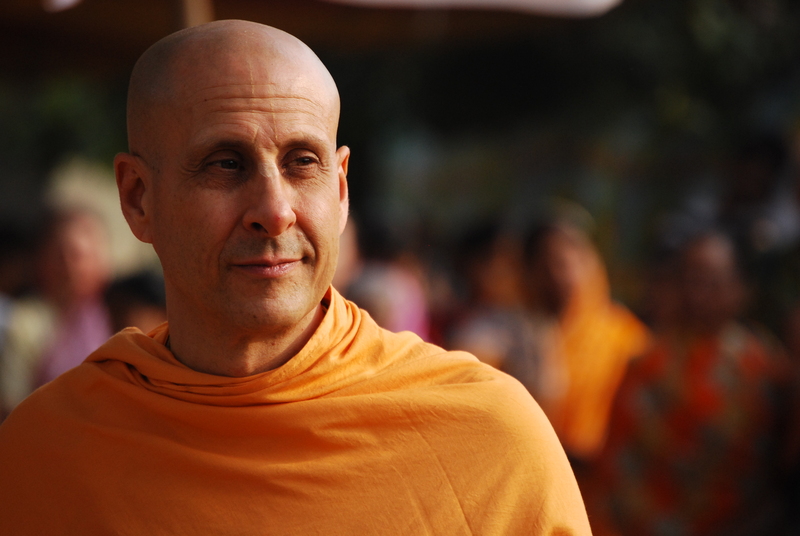 On May 16, 2016, His Holiness Radhanath Swami visited us at Srila Prabhupada’s very first gurukula, TKG Academy, in Dallas. Our only prayer is that he can come back again and again and again. Next time, we may need to tell the kids ahead of time to just “listen”.